Silly and serious, big and small, frightening and friendly-scarecrows created by our Nashville community will invade our gardens again this fall. 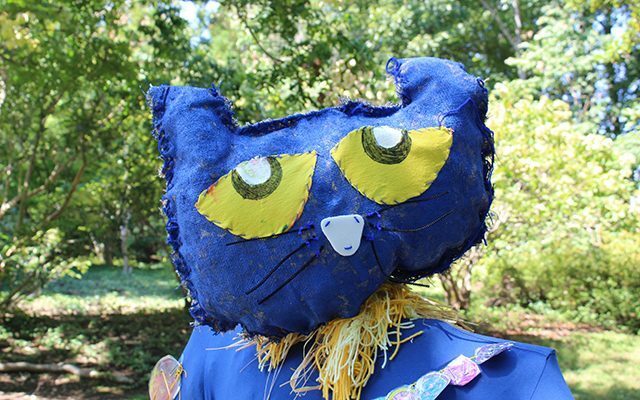 Get in on the fun of Cheekwood Harvest by assembling a group in your school, workplace, church or neighborhood and designing your own custom scarecrow! Submit your registration form online (see below). Await further communication from Cheekwood staff. Begin brainstorming your scarecrow design. Pick up your scarecrow frame from Cheekwood (more details to follow). Send in your group’s scarecrow name and your artist statement. Return your scarecrow to Cheekwood for display. Visit your scarecrow in Cheekwood’s Turner Seasons Garden! Scarecrows must be family friendly and appropriate for all audiences. Entries that are not in good taste, overly political, or contain overt brand advertising will not be accepted or displayed. Materials that can withstand being outdoors for the duration of the exhibition should be used. Any Scarecrow that deteriorates beyond acceptable condition may be removed by Cheekwood at any time. Scarecrows are to be delivered to Cheekwood fully assembled during the dates and times specified in Cheekwood communications. If a scarecrow is not fully assembled, Cheekwood staff will be unable to install it. Cheekwood staff will remove and dispose of scarecrows at the end of the exhibit if they are not picked up during specified times below. To get in on this fun community event, simply complete this online form by 5 pm on Friday, August 10. After submitting this form, you will receive a confirmation e-mail with more information. If you have questions, contact Rachel at rdraper@cheekwood.org. The Scarecrows application is closed. Thank you for your interest in participating! Be sure to come see the Scarecrows during Cheekwood Harvest. Questions? Contact Rachel Draper at rdraper@cheekwood.org.